Rental trenchers come in different sizes and styles. Digging from 12 to 48 inches deep and 3 to 16 inches wide should be no problem with a walk-behind or ride-on trencher. The digging tool will depend on the required depth and width of the trench as well as the hardness of the surface. With this type of trencher, you stand behind the machine, pull the handles toward you, and walk backwards. Walk-behind trenchers are ideal for digging a trench in a tight space. For bigger yard jobs, consider renting a ride-on trencher. These trenchers have larger cutting blades that are able to dig deeper and wider in a single pass so you can create long trenches faster. A chain-blade trencher is a machine with a giant chainsaw attached to it. 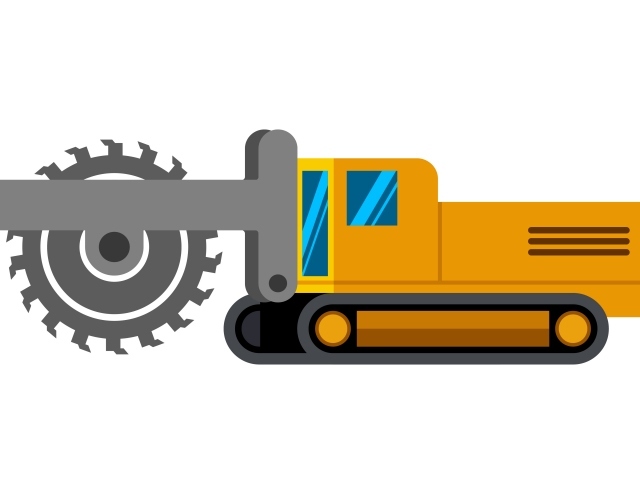 If you need to dig through a hard surface that an excavator cannot penetrate, then this is the right equipment to rent. The rotating toothed chain will be able to pierce through the ground, with the boom angle completely adjustable according to cutting depth. Multiple chain types are available, including chains with cutting teeth, shark tooth blades, and bullet-type blades. Cupped teeth can easily cut through compacted ground and scoop up dirt. Inspect the chain on a trencher before choosing an equipment to rent as teeth can break occasionally. Instead of a chain blade, the wheel trencher has a giant cutting wheel in front. The circular saw blade can dig through harder materials such as rocks and tree roots. Another advantage of wheel trenchers is that you can set the depth of the cutting wheel as well as the final width of the trench. Wheel trenchers are quite popular because they can finish the job faster than a chain trencher. This specialized trencher is designed for installing edging material. Trenches are typically not as deep since edging material only requires a few inches of depth. Ask the rental company if they have this type of trencher if you need to dig around a flower bed, sidewalk or yard item. If your project entails wire installation, this machine can get the job done much faster than regular trenchers. Wire trenchers are built with a wire feeding device that automatically installs a wire in the trench as you dig through the ground. Discuss your next home project with an experienced equipment rental company. We can recommend the right trencher for the job. Call us today.